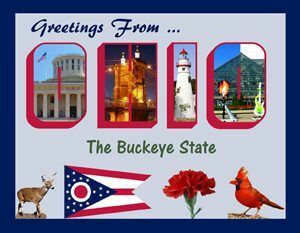 Greeting from Ohio Postcard, available at Legends’ General Store. The 17th State, Ohio joined the Union on March 1, 1803. 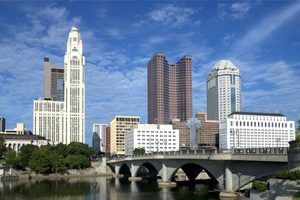 Its state capital is Columbus, and its name comes from the Iroquois Indian word meaning “good river” or “large river”. Ohio gained its more commonly known nickname from the many buckeye trees that once covered the landscape, and from the Presidential campaign of William Henry Harrison, an Ohioan from Virginia who was dubbed “the log cabin candidate” and chose his campaign emblem as a log cabin made of buckeye timbers, along with a string of buckeye nuts decorating its walls. State Slogan – “So Much to Discover; Birthplace of Aviation”. Previously “The Heart of it All”. Ohio is also the only state to have an official rock song. “Hang on Sloopy” is a song from The McCoys in 1965, who were originally from Dayton, OH. State Tree: Buckeye (The trees are named such because the nuts from the tree resemble the shape and color of a deer’s eye). Columbus, Ohio Skyline 2009. Photo by Carol Highsmith. Click for prints and products. The state flag of Ohio, adopted in 1902, has a large blue triangle representing the states hills and valleys, and the stripes represent roads and waterways. The Ohio Burgee, as the design is properly called, is a “swallowtail flag” and the only non-rectangular state flag in the U.S. The group of thirteen stars represent the original thirteen states, with the four starts at the peak of the triangle symbolizing the fact that Ohio was the 17th State admitted to the Union. The “O” represents Ohio and the states nickname “buckeye”. Before 1902 there was no ‘official’ state flag.